Auburn has released a statement. That statement (below) consists of facts and stats regarding Tre Mason in hopes to help voters realize what the nation has been missing for the past few months. It’s absolutely ridiculous that he’s not getting the publicity he should, but hey, sports writers make their minds up far advance, and are always right, right? 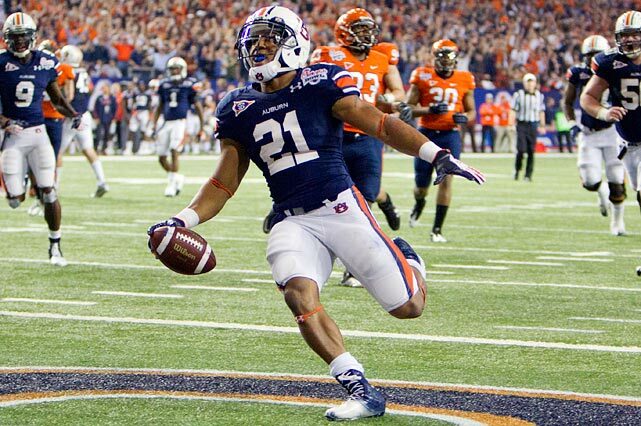 Please consider Auburn junior RB Tre Mason for Heisman Trophy, who helped lead Auburn to the 2013 Southeastern Conference title and a potential trip to the BCS National Championship game. Tre has been part of an Auburn team that tied an NCAA record for greatest single-season turn around (+8.5) and is one of the greatest rushing units in SEC history averaging 335.7 yards per game. The AU offense features four players with over 500 yards rushing, including two 1,000 yard rushers. Below are his statistics and supportive materials regarding Tre. ** 1,621 rushing yards second-most in school single-season history behind Bo Jackson’s 1985 Heisman Trophy season (1,786 yards). ** 22 rushing touchdowns are a school-record, breaking Cam Newton’s previous mark of 20 set during his Heisman Trophy season in 2010. ** 22 rushing TDs are second-most ever in SEC history behind Florida’s Tim Tebow’s 23 in 2007 (Heisman Trophy winning season) and one more than Texas A&M’s Johnny Manziel in 2012 (Heisman Trophy winning season) and Alabama’s Trent Richardson in 2011. ** Auburn single-season record-holder for all-purpose yards with 2,137, breaking the previous mark set by Bo Jackson in 1985 (1,859). ** In four games against Top 10 teams this season (Auburn 3-1), Mason rushed for 778 yards and eight touchdowns, an average of 194.5 yards and two TDs. ** In 9 games versus SEC opponents, has 1,289 yards rushing (143.2 ypg) and 17 touchdowns. ** Mason’s 304 rushing yards (on 46 attempts) in SEC Championship game were the most by an Auburn running back since 1944 when Curtis Kuykendall had a school-record 307 yards against Miami (Fla.). ** Mason’s 304 rushing yards were the fifth most in SEC history and most since Arkansas’ Darren McFadden had 321 against South Carolina in 2007. ** Mason’s 46 rushing attempts against Missouri were a school record and second most ever by an SEC player (47 by Georgia’s Herschel Walker vs. Florida in 1981). ** Has rushed for 100+ yards in five consecutive games and a rushing TD in 10 consecutive games. Do the right thing, voters. Put Tre in New York.